14th November – London – Thunderhead, the global leader in customer engagement and journey orchestration, has today been named as a Leader in The Forrester Wave™: Journey Visioning Platforms, Q4 2018, and The Forrester Wave™: Journey Orchestration Platforms, Q4 2018. The Wave™ research identifies the most significant platforms, evaluating current offering, strategy and market presence. In both reports, Forrester notes that Thunderhead is amongst the vendors that ‘lead the pack’ and ‘matter most’ in the market assessed. 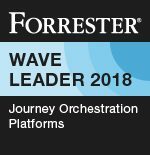 Of the eight (8) Orchestration platforms evaluated in The Forrester Wave™: Journey Orchestration Platforms, Q4 2018, Thunderhead scored highest in the Current Offering category and received the highest possible score in the Strategy category. In both reports, Forrester comments on Thunderhead’s ‘sleek visualizations’ and ‘analytics, decisioning rules, and AI to drive real-time engagement’. Thunderhead’s pioneering cloud technology has a unique approach to the customer journey, based on its belief that it is the customer who manages their own individual journey. ONE has been specifically designed from the ground up to help brands build individual customer relationships at scale in today’s customer-centric digital economy. ONE leverages Machine Learning and AI to surface individual customer context and intent, and provides CMOs and CX leaders with the means to take action through real-time decisioning and orchestration, ensuring customer needs and expectations are met, in-the-moment, wherever and whenever they choose to interact. Thunderhead’s recently announced Intent Analyzer adds an even deeper layer of journey analysis and audience discovery. It is a new solution that allows brands to easily discover and apply holistic customer insights at the higher levels of complexity demanded by larger enterprises. Eamon Collins, Global Marketing Director, PageGroup “At PageGroup we realized that becoming ever more customer-centric is key to our ongoing success as a leading global recruitment business. Adopting a real-time customer journey approach to our marketing is critical in achieving this. Using Thunderhead, we’ve been able to look at our customer relationships from a journey viewpoint, giving us the ability to understand intent in real-time and then respond to an individual’s specific needs. We are now delivering personalized and relevant engagement providing our customers with the value they’re looking for at that moment in time. The ONE Engagement Hub deploys rapidly, and very quickly we were able to use the journey insight to make our marketing more intelligent, relevant and more like a conversation, helping us to build valuable relationships with our customers. Glen Manchester, CEO and Founder, Thunderhead notes, “In today’s customer-driven digital economy, brands understand that the customer relationship is the true source of long-term value, as the success of direct to consumer and the subscription economy is increasingly demonstrating. At Thunderhead we understand this is a strategic imperative for all brands, and that the key to achieving true customer-centricity is to be able to understand relationships through the lens of their many and varied customer journeys, ensuring that every journey meets the needs of every individual customer. We built ONE to address this challenge head on, closing the gap between what customers expect and what brands deliver, and providing seamless customer engagement at scale, fulfilling the vision of CRM. Established in the UK in 1976, PageGroup has grown to become one of the world’s best-known and most respected recruitment consultancies. With operations in 36 countries, PageGroup provides recruitment services and career opportunities on a local, regional and global level. PageGroup operates four key brands: Page Executive, Michael Page, Page Personnel, and Page Outsourcing, supported by additional brands across our business. A recognized global leader in the customer engagement market, Thunderhead is headquartered in London and has its development HQ in Boston. Thunderhead. Customer Engagement just got personal.